Need a new walking stick for mobility or fun? Love pool and/or billiards? Great - a pool cue walking stick is right up your alley. 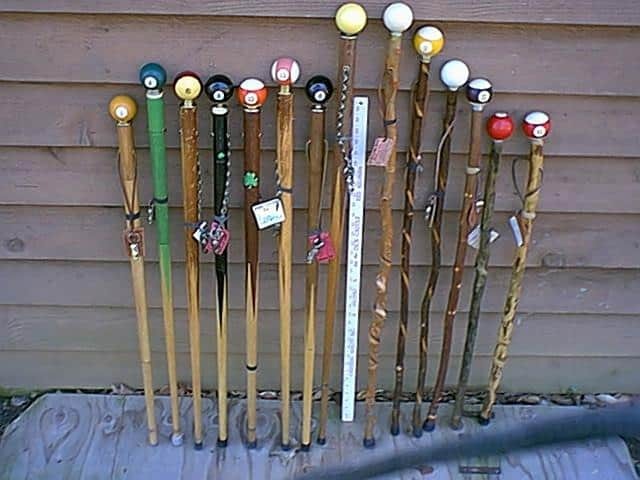 This page is all about walking sticks with pool cue features - if you're considering one, read on to learn all about them and where to find the best deals on the best models. 1.1 As a temporary stick (if you need one). 1.3 For the intimidation factor. As a temporary stick (if you need one). Looking to switch things up? Get a pool cue walking stick to use on special occasions or game nights. The luxury ones start at $1,000+, but you can get a respectable one for right around $50 - $100. Look for a cue stick design that's more "in the background" if you need your stick for actual mobility - novelty sticks usually aren't made for regular use. If someone you know loves pool or billiards, a pool cue walking stick is never a bad gift idea. We'd recommend looking through the selection below until you find one that suits your loved one perfectly. Playing pool while using a pool walking stick at the same time? No further explanation needed. Playing pool while using a pool walking stick at the same time? Equals an intimidated opponent, 99.9% of the time! It's entirely possible to use one of these specialty pool walking sticks as your daily cane, but you probably can't use the vast majority of models available. You need both ﻿design and durability. Most of the time, manufacturers will specify as to whether the cane can be used every day or not. You can always call to confirm (we would recommend doing so). On the other end of the spectrum, you can get crazy pool cue walking sticks that have jewels, bright colors, images, and anything else you can imagine. They're not very functional, but they can look amazing. Some even have the base of the cane as an 8-ball, not regular wood. You can usually customize the bottom if you're looking at a model that includes this feature. You've probably never noticed your local cane shop, but it's there. They're usually tucked away in corners, filled with amazing aromas, high-end canes of all types, and friendly, knowledgeable staff. See if there's one near you, and if there is, make the trip to look at the pool-related canes. Sometimes, local pawn shops will have pool walking sticks, too, but it varies based on location and the quality of the pawn shops near you. Make some calls and see if you can get a good deal on a second-hand stick. Manufacturers list on eBay and regulars sell their new/vintage pool walking sticks on eBay as well. You'll find everything on here. Make sure to buy from a seller with at least 95% positive feedback. If you have a billiards shop near you, they will absolutely have at least a few billiards or pool walking sticks for you to look at and test out. Big box stores like Walmart and Target will often have walking sticks, too. If you have one of those massive big box stores near you, there's a good chance they have them. If it's a smaller one (like in a city), you might have to look online. Luckily, both billiards shops and big box stores sell pool walking sticks online. Go to one of the retailers below and start browsing. You can look for other pool accessories, too - the billiards shops especially have some really cool stuff. That's about it - pool walking sticks exist, there are a lot of them available, and you can find them in multiple locations both online and locally. Scroll up to one of the retailers above and get started on your search for your new cane. Good luck!